As a former chairman of the Public Accounts Committee, David Davis was always likely to want to contribute from the self-imposed freedom of the backbenches to the debate about how to get the public finances under control. And today, through an article in the FT, the former shadow home secretary addresses the question of where the Government - and therefore a future Conservative government - could find savings. "The choice we face is not between Labour growth in public services and Tory “cuts”. It is between taking a grip of the public finances and watching our people’s economic prospects, and our ability to afford decent public services, slowly dribble away." Probably the biggest concern of those of us who were sceptical about Ken Clarke returning to the Shadow Cabinet was how he would deal with collective responsibility on the European question - especially with the impending campaign for the elections to the European Parliament. Today he has answered those questions directly in a Q&A with readers of The Independent. "I will consider invitations to campaign, but some of our European election candidates may feel as I do that I would not be the most persuasive of advocates on some of their campaigning issues." "Conservative policy on Europe has been settled by David Cameron, and I have no intention of seeking to change or challenge it. The policy is reasonably moderate and the policy does not provide any justification for me declining to join the Shadow Cabinet at a time of economic crisis or accept collective discipline, as British politicians always do in our system of parliamentary government." Since his appointment to the Shadow Cabinet I have been generally impressed with his performances at the Despatch Box and in the media. He is a star turn with box office appeal and as long as he sticks to his pledge not to rock the boat on Europe as outlined above, his return makes the party stronger as it takes the fight to Labour. Incidentally, it's worth reading the Independent Q&A in full as Mr Clarke also addresses, among other things, his acceptance of party policy on recognising marriage in the tax system - "I am now directly exposed to the collective wisdom of my colleagues", his relationship with George Osborne - "he is cut out to be the next chancellor", and his previous involvement in the tobacco industry - "I am a strong believer in personal responsibility and freedom of choice". The newly-appointed shadow business secretary Ken Clarke gave his first speech in his new post today, to a conference hosted by the think-tank, Reform, at the London Stock Exchange. In typical Ken style, he opted to speak off the cuff for 15 minutes, so no text was released in advance (or afterwards, for that matter). However, I have managed to obtain a transcript of several key passages, which are reproduced below. “My reaction to this crisis is that I have not lost my conviction in the values of capitalism. I believe in free markets, free trade and globalisation, which I think have collectively led to some remarkable changes in living standards here and across the world in the last twenty years. “We are going to have to argue that case. The reaction of many people to this crisis is that we have to challenge the fundamentals, that the markets as a whole have been proved to be wrong. You will find that argument deployed across very wide fields. It is the wrong reaction to what is a failure of banking, a failure of credit markets, a failure of money markets and failure of regulation. There has been considerable media coverage over the last week of comments made in December by Ken Clarke which attacked the party line on recognition of marriage in the tax system and suggested that a Cameron Government would be more pro-Europe than the Tory Party has been in opposition. We covered the stories here and here once they had hit the national media, but noted that both Tim and I had attended the conference where Ken Clarke made those remarks (when he was still a backbencher). Our understanding was the the conference - hosted by the Centre for British Politics at the University of Nottingham - was off the record; indeed, the account which Tim published just after the event was explicitly agreed with Mr Clarke's office. "My name's Rory Baxter and I'm the journalist who attended the Nottingham seminar and picked up Ken's comments. I wrote both exclusive pieces on Ken's views on Obama and Europe (here's the original story, not the one the media ran: http://www.publicservice.co.uk/feature_story.asp?id=11168) and on Ken's views on public service spending and marriage. They have been picked up by virtually every media outlet under the sun, especially the first piece I did where they attempted to suggest Ken was calling Cameron a 'right wing nationalist'. I didn't get that impression when I was there and I didn't write it that way. I can't control how the media treat such stories but I do believe they were, as they say, in the public interest, as we can see by the huge amount of feedback they have generated. Below is a sight many of us didn't think we'd be seeing: Ken Clarke responding to a government statement from the Opposition Despatch Box this afternoon as shadow business secretary. Alan Duncan is clearly enjoying the performance given by his successor. Mr Clarke described it a "consitutional outrage" that due to Lord Mandelson's being a member of the House of Lords it was their Lordships who heard the statement first and the Commons had to make do with having it re-read by Business and Enterprise Minister, Ian Pearson. The new shadow business secretary suggested that the Government package announced today was "pretty small beer", wondering whether, for the first time, the Treasury had actually won an argument with a government department which wanted money and not produced a bail-out because it couldn't be afforded. He accused the Government of having dithered on how to respond and mocked the new trade minister, Lord Davies, for the fact that one of his first decisions in government had been to set up a task force. Altogether, a solid first outing for the big beast from Rushcliffe. Tory sources have confirmed that Ken Clarke is returning to the Tory frontbench. As we predicted last week, the Tory reshuffle has been brought forward and other announcements will be made tomorrow, probably all finalised by lunchtime. Mr Clarke will be Shadow Business Secretary. He will replace Alan Duncan who is being offered a different "senior role". CCHQ is briefing that it was in December that George Osborne first suggested a frontbench role for the former Chancellor and thrice-defeated leadership candidate. The Telegraph's Andy Porter got there first in terms of media speculation. That was when the Conservatives were faltering in the polls and Mr Clarke's return was seen as a quick route back to economic credibility. Over lunch yesterday (Saturday) George Osborne, David Cameron and Ken Clarke met to agree terms. That it was Osborne rather than Hague at the meeting confirms that it is the Shadow Chancellor who is the real Deputy Leader. Mr Clarke has accepted that the Tory position on Lisbon, the EPP and the Euro is settled. He won't attempt to change party policy but neither will he change his views. His focus, says the spin, will be 100% on his new portfolio and the interests of British business. David Cameron has gambled that any internal unhappiness at Mr Clarke's return will be smothered by the renewed Conservative strength in the opinion polls - now 13% ahead according to YouGov. Mr Clarke brings immediate media firepower to the Tory frontbench. Any announcement from his office will attract media attention but you can expect lots of 'Clarke overshadows Osborne' stories to come from mischievous sections of the press. ConservativeHome opposed Mr Clarke's return but a plurality of grassroots members (50% to 41%) supported a comeback. This morning's Sun carries a report that David Cameron has "sensationally anointed William Hague deputy Conservative leader". “William is effectively my deputy in all but name and people need to know that." Given that Mr Hague is already the "Senior Member of the Shadow Cabinet" who occasionally stands in for Mr Cameron at PMQs, it struck me that the story is hardly worthy of the adjective "sensational". However, on further reading, it does become clear that the shadow foreign secretary's status is to be bolstered, with Mr Cameron giving his predecessor-but-two as Tory leader more prominence in carrying the party's message around the country with a "massively expanded roving brief to front the Tories’ election battle with Labour". “I wouldn’t take on this new role if I didn’t feel the atmosphere of personal support was not so strong. Normally, relations between senior politicians are fraught and tense. I have been motivated to take this on because of a quite different atmosphere I have experienced. There is no factionalism or rivalry. David sets a great team atmosphere". “I have been drastically cutting my outside interests. That will continue. There won’t be a lot left by the time we are approaching the election." I am a big fan of WIlliam Hague and so are ConservativeHome readers, based on his regular high ratings in our monthly readers' surveys. As such, I can only welcome any decision to give him more prominence in the run-up to the general election, whenever that may be. Jonathan Isaby's pick: "My selection for backbencher of the year goes to someone who could equally have been nominated for the frontbencher award - as he was a member of the shadow cabinet for the first half of the year. But the decision by David Davis to resign from Parliament and fight a by-election in his Haltemprice and Howden constituency - was always going to consign him to the backbenches, quitting as he did in protest at the Government's attempt to lock up terrorist suspects without charge for 42 days. He could have expected a serious Cabinet job in a David Cameron government but sacrificed those career prospects on a point of principle - a rare act in politics these days. SInce his re-election at the by-election - during which he assembled an impressive coalition of support to attack this increasingly authoritarian Government - he has remained an articulate and doughty defender of civil liberties and arch-critic of the Government." 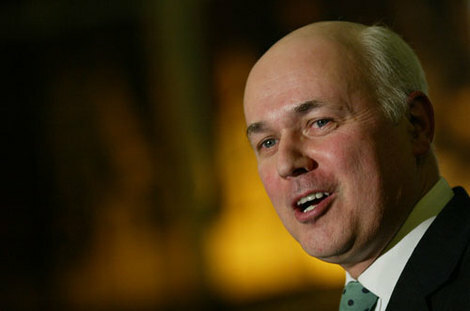 Tim Montgomerie's pick: "My pick is Iain Duncan Smith. It's a very biased choice as I also regard Iain as a close friend but the steady transformation of his reputation has been extraordinary. 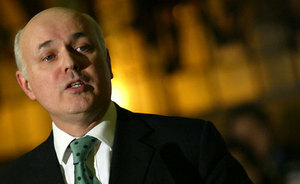 His reputation was in tatters (unfairly) when his leadership of the Conservative Party ended but he now enjoys respect across the political spectrum and more importantly - as far as he is concerned - from the poverty-fighting groups that he pledged to champion when he was Tory leader and on the night he lost the leadership. He is now used as a general commentator on social breakdown with media organisations using him to respond to stories that only have a loose political dimension. But it is the ground-breaking work of his Centre for Social Justice that gives his work such credibility. Always rooted in the wisdom of frontline poverty-fighters this year's published research includes the importance of the earliest years for child development, the breakdown of systems for children-in-care, Britain's asylum shambles, social housing and welfare reform. No wonder, according to BBC research, David Cameron makes more mention of Iain Duncan Smith than any other Tory colleague." Who would you have chosen as Backbencher of the Year? "If I was asked, I'd certainly think about it." That was Ken Clarke on this morning's Week in Westminster, asked by Steve Richards if he would be David Cameron's Shadow Chancellor. You know my view on the prospect. We've had three opinions polls over the weekend - from ComRes, YouGov and in today's Mirror from Ipsos MORI. Taken together they point to a hung parliament and in The Sun Trevor Kavanagh raises the prospect of a February election. "He has what his party’s front bench apparently lacks: “bottom”, that combination of independent-mindedness, experience and gravitas that makes people listen and trust. There is no doubt that if he became shadow chancellor the Tories’ credibility would soar. His return to the team would wipe the smirks from Labour faces as surely as Mandelson’s reenlistment shook the Conservatives a few weeks ago. Labour could then hardly taunt the Tories as Etonian toffs, for nobody looks less Bullingdon club than Clarke." Ken Clarke is a big beast who has served the party well but he has also been guilty of considerable disloyalty. He attempted to sabotage William Hague's 'Save the pound' campaign in the late 1990s, only recently attacked David Cameron's human rights bill as "xenophobic" and opposes leaving the EPP as a "head-banging" policy. He would undermine David Cameron's 'change' message - not just presentationally but his ideas are out-dated. He doesn't, for example, support the Tory leader's flagship policies on the family and would resist recognition of marriage in the tax system. As Chairman of the Democracy Taskforce his recommended answer to the West Lothian Question was timid. 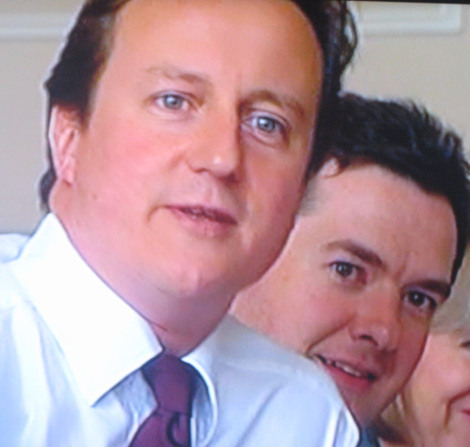 A healthy Chancellor-Leader relationship is vital to the success of any political party. The Osborne-Cameron relationship works. A Clarke-Cameron relationship would be a huge gamble. More broadly there is no need for panic. I've already set out some reasons why the 'bite of recession' will cause bigger and bigger political problems for Labour and listed the broader political factors that favour the Conservatives. I sign up to Mike Smithson's rule that the more David Cameron is in the media the better the Conservatives do in the polls. I also believe that it would be wrong to change George Osborne now that the party has the right economic position. Business leaders write to today's FT endorsing the Tory idea of underwriting bank lending. Opinion-formers are also coming over; Saturday was notable for two of the Mail's biggest columnists, Amanda Platell and Peter Oborne, endorsing David Cameron's tough-but-prudent economic stance. Yet again Michael Portillo offers advice that is best ignored. Update: The report on the BBC website includes extensive quotes and has a video of the interview. Sir John Major joined the attack on the Government's handling of the economy this morning, in an interview with Andrew Marr. He said that we were facing the worst economic situation since the Second Word War and that the Government's actions were now going to make the recession "longer and deeper". He also expressed the view that the unemployment figures were far worse than they appear due to the number of people on long term benefits who could be working and that he expected "an avalanche of job losses" during the first half of next year. He did add, however, that talking in the same terms as the depression of the late 1920s and early 1930s was over the top, but that depression oratory was being used in order to help ministers justify the high levels of expenditure and borrowing. "They are over cooking it because they are concerned and they want to justify the amount of debt they are getting into," he said. Sir John said that the Government was right to recapitalise the banks but declared the VAT cut pointless - "you might as well have burned the money and thrown it away" - and said that he believed savers were currently "appallingly treated" because the amount they are earning in interest has dropped dramatically. He proposed that the first £5,000 of savings income each year should be exempt from tax and also urged David Cameron to extend his proposed bank loan guarantee to homes as well as businesses. "We looked particularly heartless just sitting there. We looked very heartless and we paid a heavy political price for it. But we did kill inflation for a very long time." Former Chancellor Ken Clarke has given an interview to tomorrow's Times (Saturday) rich in quotes in which he reiterates his support for George Osborne and states again that he does not want a frontbench job. Here are some of the highlights of what he has to say. Today, The Daily Mail devotes its leader column to IDS' renaissance. You can read it in full here. 11.15am update: The Evening Standard is reporting that George Osborne is to cut back his workload on strategy and election co-ordination to concentrate his efforts on being shadow chancellor. There's a lot of speculation about George Osborne at the moment. Some of it ill-founded. The London Evening Standard reported yesterday that the backbench 1922 Committee was unhappy with the Shadow Chancellor. I understand that that is simply untrue. But it would be wrong to say there aren't many MPs who share the anxieties of the grassroots. At Lord Ashcroft's book launch party on Tuesday evening - in the space of just thirty minutes - I spoke to four MPs who were all wanting a more robust economic policy from the frontbench. "With the economy entering a deep recession, GDP expected to shrink by 2 per cent next year according to the Bank of England and unemployment heading beyond 2 million, the response of the Tories is inadequate. Proposals to reduce the tax burden on employers were heavily trailed this week and after all the roaring the Tory leadership produced not a lion, but a mouse... Osborne should be moved, by early next year, to a prominent position that suits his talents. He is tactically astute, with a first-rate organisational brain, is a good analyst of politics and on his day can be an impressive media performer. In the post of party chairman and election campaign supremo, he would be perfectly placed to be the focal point of a currently confused CCHQ operation and even take on and beat his enemy, the Dark Lord, Baron Mandelson of Foy, in the biggest arena of all: a general election." In substance Iain Martin is right. George Osborne would be better at CCHQ and ConHome recommended just such a move over a year ago. I worried about the lack of clear structure at CCHQ and thought a more experienced figure should be Shadow Chancellor. Unfortunately that advice was rejected. Last Christmas David Cameron said that George Osborne would be his Chancellor and we gave up our campaign. Last year was the right time to move George Osborne. Now it's much, much trickier. As Ben Brogan blogged yesterday, any move now would be a big scalp for Labour. That's just one reason why Cameron won't make the change although Paul Waugh responds that Labour's ideal scenario is actually for Osborne to continue; "wounded" and "limping". Labour would fear Hague or particularly Ken Clarke as replacement. But as Iain Dale said yesterday: "It. Ain't. Gonna. Happen." 6.30pm The full transcript of the interview is now online in which David Davis also talks about the discussion he had with David Cameron and George Osborne about tactics on the 42-day issue. Former shadow Home Secretary David Davis has given an interview to tomorrow's New Statesman in which he reveals how desperately David Cameron tried to stop him from resigning his seat (and frontbench post) to fight that by-election in Haltemprice and Howden earlier in the summer. He is remarkably frank about Cameron's reaction to his subsequent fait-accompli resignation. "Well, he was a bit surprised, to say the least. He said: 'Why?' His first question was why. And I went through it, and he said: 'Well, I don't . . .' [Davis hesitated] ' . . . it's very risky.' And I said: 'Yeah, but the risk is all mine, David.' And he said there is a risk to our lead [in the polls]. I said, no, I don't think there is. [I said] I think actually you'll find that the public will respond well to this, and he wasn't at all sure about that, so there was a difference of view." Did Cameron try to dissuade him from resigning? "Yes, of course he did." How strenuously? "Well, several times during the course of the evening. Leaders don't have great tranches of time." Davis went on to describe how a panicked Cameron was repeatedly ringing his outgoing shadow home secretary's mobile phone. "And he wasn't the only one." Who else? Osborne? "I'm not going to get into that," he said, laughing. Davis goes on to admit that he realised what a difficult position he put David Cameron in and that he was indeed "rocking the boat". But he says without hesitation that the Conservatives can win the next election under David Cameron, even accepting that his leader may be more in tune with modern Britain, before mischievously adding the proviso: "in the south anyway". David Cameron usually appears on his own at his monthly press conference and always puts in pretty flawless performances. In recommending that he appears alongside his top colleagues we are not suggesting therefore that there is any weakness in David Cameron's command of the issues. But if his press conferences regularly involve other colleagues - making statements as well as answering questions - he starts to communicate the depth and breadth of the Tory team. Our politics is too presidential. Our party's frontbench is more than the equal of Brown's. Let's show it off. "Lord Ashcroft, the billionaire who has helped to bankroll the Tory party and is now its deputy chairman, is to leave most of his money - about £900m - to charity. It could be the biggest charitable bequest made in Britain and will be shared between causes ranging from arresting criminals to assisting wounded servicemen and saving whales. Ashcroft's three children will get only about 20% of his fortune, but he claims they will have the consolation of enjoying giving away his money." The former Shadow Home Secretary obviously didn't get the memo. David Davis enjoyed a few glasses of champagne in a Commons bar last night with the Director of Liberty, Shami Chakrabarti and his successor Dominic Grieve. And who can blame him? Labour suffered a massive defeat in the Lords yesterday on the issue that he has made his own; '42 days'. There were 309 votes against the Government. 118 in favour. "The vote was decisive. The proposal to extend pre-charge detention failed on three significant grounds: necessity, desirability and practicability. On all sides of the House of Lords the majority view - drawing on significant experience in policing, security and the law - was that these provisions should be completely removed. The Government produced no evidence to support an extension to 42 days. The extension would have been disproportionate and, in any event, so unworkable that the police and prosecutors would not have used it." So heavy was the defeat that the Home Secretary Jacqui Smith has now decided to remove the 42 days proposal from the Counter Terrorism Bill. The numbers show that the Tories have an edge but they're far too close for any complacency. "There is some discussion that David Cameron's first Cabinet should include some of the big beasts from the Major years. Which of the following individuals would you like to return to the frontbench?" Dylan Jones' new book Cameron on Cameron is a series of interviews with the Conservative leader. Yesterday we focused on highlights discussing the economy and taxation. Below are some highlights of Cameron's responses relating to other politicians.